The first black and white photograph was taken by Joseph Nicéphore Niépce in 1826. During the 19th Century, photographs were almost exclusively black and white or sepia tone. Color photographs, which were originally produced by hand tinting black and white photographs, did not become common until the 1930’s (100 years later). The advent of digital imaging with its low cost and ease of use, helped cement color as the dominant photographic form today. Black and white images, however, continue to be produced, particularly by advanced hobbyist and art photographers. My love of Black and white photography was inspired by the work of legendary photographers like Ansel Adams, Henri Cartier-Bresson, Edward Weston, Dorothea Lange, Alfred Stieglitz and Richard Avedon. I n Later on, I had the opportunity to view some of Ansel Adams original photographs on display at New York at galleries and in the offices of the Sierra Club in Washington DC. Ansel Adam’s work can be viewed at anseladams.com. In my journey to improve my photographic skills, I set up a temporary darkroom, and began learning to develop my own black and white film and prints. I was captivated by the gradual, seemingly magical, appearance of the image as it developed in the tray. Developing black and white prints from film is a lengthy process. Producing a set of black and white prints in the darkroom may take several relaxing hours in the dark or dim light. During this process, all the world’s problems seem to disappear as you become solely fixated on producing your perfect black and white print. When I retired, I planned to expand my photography hobby with a new black and white darkroom. However, the rapid advancements in digital imaging caused a change of plan, and that darkroom was never built. I now do my processing on a computer using Adobe Photoshop. While working in Photoshop does not provide the same enjoyment as working in the darkroom, it does provide a level of control over the final image which was previously not available to the amateur photographer. 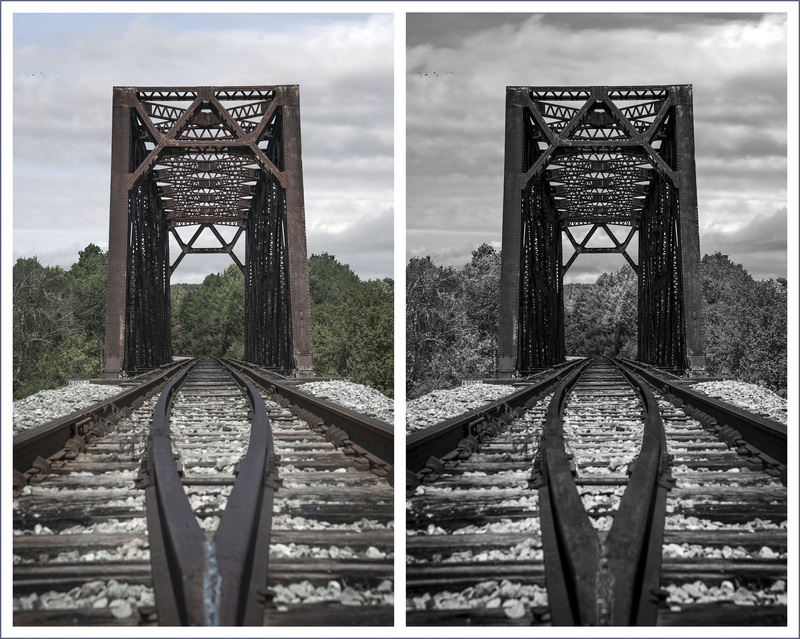 With a black and white image all the hue (color) and saturation (purity of color) in the image are removed and only shades of gray remain. A black and white image is less of a literal reproduction of the captured scene and more of an abstract representation. This frees the photographer, and gives them license to interpret the world in a different manner. In black and white photography, the fundamental elements of line, shape, pattern, contrast, and texture work together to form the foundation of the image. Becoming a good black and white photographer requires learning how to compose scenes in which these fundamental elements are more vital than the color. Most image processing software will allow you to convert an image from color to black and white. More advanced software, such as Adobe Lightroom and Adobe Photoshop, allow you to change the range of gray tones produced by the different colors. This allows for more artistic options in the representation of a scene. Try your hand at black and white photography and learn another artistic side of photography.